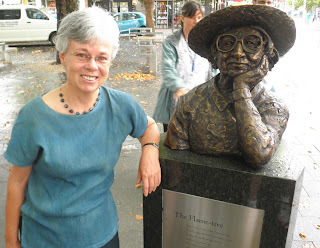 Today (30 January) was the official opening ceremony of Poets' Corner at Garema Place, Canberra ... a main thorough-fare for shoppers in central Canberra ... and a Public Art initiative of the ACT Government and very much a project of the previous ACT Chief Minister Jon Stanhope. Three ACT Poets had figurative sculptures created by Cathy Weiszmann with signage by Richard Tipping... the poets selected for this Public Art were - Alec Hope, Judith Wright and David Campbell. A poem from each of these poets is attached with the works. These poems were read at the launch by prominent local poets. Geoff Page read The Heart of the Matter (David Campbell), Liz Murphy read The Flame-Tree (Judith Wright) , and Hal Judge read Spatlese (Alec Hope). Alan Gould gave an excellent address from first hand reflections from the lives of these three.